LOVE. Woohoo, my facebook page just hit 50 000 likes! This entry was posted in Fashion, Uncategorized and tagged 50k, facebook 50000 likes by Carolina Engman. Bookmark the permalink. Really congrats. You make a perfect job, Have a great day. ps. we are having a wonderful Kenzaa giv-away! We are only at the beginning! Wow, this is a serious number! Congrats! You have such a great style, you deserve it! So happy for you! wauw so cool! Congrats dear! As I told you at your facebook page, congrats dear!!!! You are amazing! Keep doing the good job, I enjoy a lot and get inspiration from your outfits! Congratulations for the 50K followers! You definitely deserves it!!! oh, girl, congratulations! keep up the great work! Congratzzzz!! your blog is just amazing!! you have such a uniqe style and I adore it!! Congrats with your 50.000 likes!! If you are ever curious about Seattle fashiom, come visit my site! congrats! you sure deserve every bit! Woooow! That’s so amazing! Congratulations girl! Big CONGRATS to one of my favorite bloggers ever! Btw, I just posted up a special outfit post and a reminder on just to ignore haters. I was recently very victimized in a group project and mistreated badly by some, hope you’d show your support (I rarely get this personal on my blog, but sometimes, haters do get you down). Congrats !! You deserve it !! That is an amazing achievement! Good work! Congratulations Carolina, great job… I love your blog!!!!! Greetings from Italy! I want that cupcake! :)) Congratulation.! What a crazy number ! Congrats ! 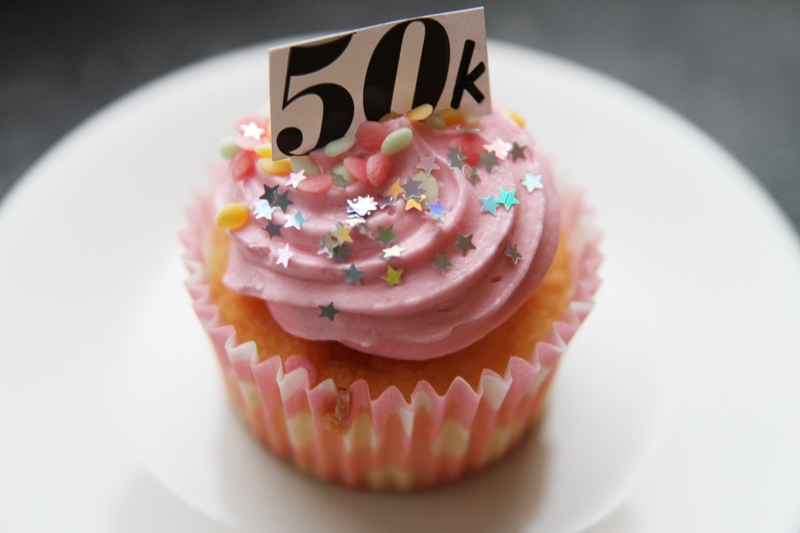 Congrats on 50,00 and…cheers to your 50,000 more!!! Me, this crazy fashion obsessed Austrian girl just entered the blogosphere! Hopefully we will meet one day!